It’s now Day 9 in the Sound Dreaming CD Concert Countdown. Over the last two days I’ve talked about the Sounding Dream Woman and the Hypogeum, so I’m going to just keep going on that topic, in part because my experiences there have become both the root and the heart of this entire Sound Dreaming project. Even calling it a project feels too cold, because truly, the effect that being in the Hypogeum has had on me over time has created a core shift in my being. But that’s the whole point, I believe, of why such a place was originally built. It stands as a landmark of a time when there was both an awareness and an honouring of the power of vibration and sound to affect change on the human body and whole being down to the cellular level. In Day 3, I spoke about the unique acoustics of the Hypogeum, and posted a picture of the Oracle Room with its ‘oracle hole’ and ceiling filled with red ochre spirals. This entire room is key to the Hypogeum, for when one sings or speaks into the oracle hole, which is no more than a carved out niche in the wall, the sound is projected or amplified throughout the entire three levels of the underground sanctuary. Amongst these three levels are many rooms, doorways, stairways, niches and windows, all carved from the limestone rock. It’s truly an architectural wonder. Another of the rooms that has red ochre spiral designs painted on its walls is called the Decoration Room. It’s up a few steps and down the hall from the oracle room and looks out into the main central area or ‘holy of holies’ as it’s called. Back in the Oracle Room, if you look carefully, you will see that there are also small spirals painted on the inside of the oracle hole niche. During one of my recording sessions, it was pointed out to me by Marlon Briffa, who worked there for many years as a guide, that to really activate the vibrational resonances of the space, it’s best to project the sound directly at these small spirals. Marlon knew well how to set the place in motion, so to speak. He did so with ease, even by gently humming a particularly pitch, the resonant frequency, which could slightly change from day to day depending on how much moisture was in the air down there. The intermittent dripping of water was an ever-present element of the overall soundscape. On both of my Hypogeum pieces on the CD, it’s Marlon’s voice that creates those incredibly low frequency drones, that just by themselves, are enough to set the brain waves going off into a different state. 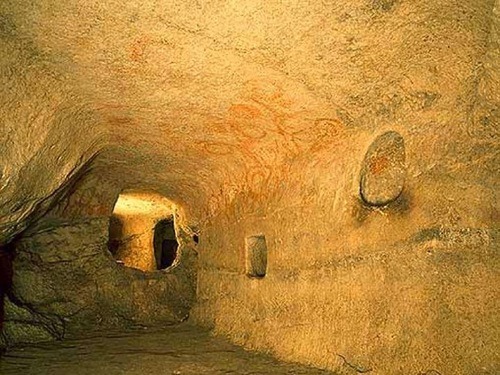 The acoustic mysteries of the Hypogeum have been the subject of much research and discussion. During the Metageum Conference in 2007 that I spoke about yesterday, one of the presenters was Paul Devereux, a British author, researcher and broadcaster who has done extensive work in the field of archaeoacoustics (the study of sound at ancient places) as well as in consciousness studies. Conference organizer Peter Lloyd had made special arrangements for him and an acoustic engineer from the USA, Thomas Anderson, to make a series of acoustic measurements in the Hypogeum to contribute towards a better understanding of why the sound behaves as it does. For example, how was it possible for a sound directed into the Oracle Hole of the Oracle Room to travel throughout the entire 3-story complex? Over the course of the conference, I learned about some of their findings, and experimented with a few of these during the recording sessions and workshops I led in the Hypogeum. One of my experiments, as suggested to me by Thomas, was to place one microphone in the Oracle Room close to the oracle hole, and another microphone in a specific spot in another chamber some distance away-up the steps, around the corner, down the hall, around another corner, and down more steps. despite the distance away, it was a very specific area where the microphone needed to be placed. Anderson had told me that in his experiments, the sound quality was pretty much identical in both these spots. And sure enough, when I got back to my computer, and input both recordings into separate tracks in the recording software and compared them, it was astonishing to hear how there was very little difference between the two. How did these ancients know of this? Was the place consciously built with a form of knowledge about the nature of sound and how it travels? I’ve already suggested that this type of structure was a conscious choice on their part, yet there remains controversy about this in the archeological circles. And, to my knowledge, nothing definite has emerged from the research done by Devereux and Anderson. During an email inquiry a few years later to Anderson, his response was that the information they gathered was extremely complex to decipher and it was almost impossible to come up with definite conclusions. But back on the ground, there is no denying the visceral affect that the Hypogeum sound has on one’s being. Everyone who goes there knows something deeply important is going on here. The two pieces I have written from my recordings there are a way I offer so more people can entune themselves to these sound mysteries. Today’s image is a view of the entire Oracle Room, before the UNESCO renovations that brought in wooden ramps, stairs and metal railings. Look carefully to see those small spirals inside the oracle hole and be filled with wonder how such a small area could multiply the sound so magnificently.